So many times, we start the new year wanting SO many things. More organization, more work, more life, more clients, more memorable moments, so so much. As Lara Casey has said, there is nothing magical about January 1st. However, I think because January 1st is the start of a new year and so many people talk about changes they want to make, it's easy to think about our own lives and businesses and things that we want to change. And usually, we want them all done right away. And that just can't happen without causing ourselves too much stress. There are so many hours in a day that we need to devote to work so that we can still have a life outside of it, and although we may want to do all sorts of things differently right off the bat, we also need to remember that things don't change overnight, and the best things are worth waiting for. By planning goals and implementing things differently slowly, changes will happen. This amazing series of posts by Heart Love Always is a great way to start you on that path. I read this quote by Helen Keller the other day and it has completely stuck with me. "Be happy with what you have, while working for what you want." It is such a perfect reminder of the way we should look at January 1st. We all have so many things to be thankful for already - and yes, there are always changes to be made that will make lives better in our eyes, but we need to remember to be happy with what we have accomplished so far while working towards bigger things. So with that said, as you go into 2016, I hope you keep these words in mind. 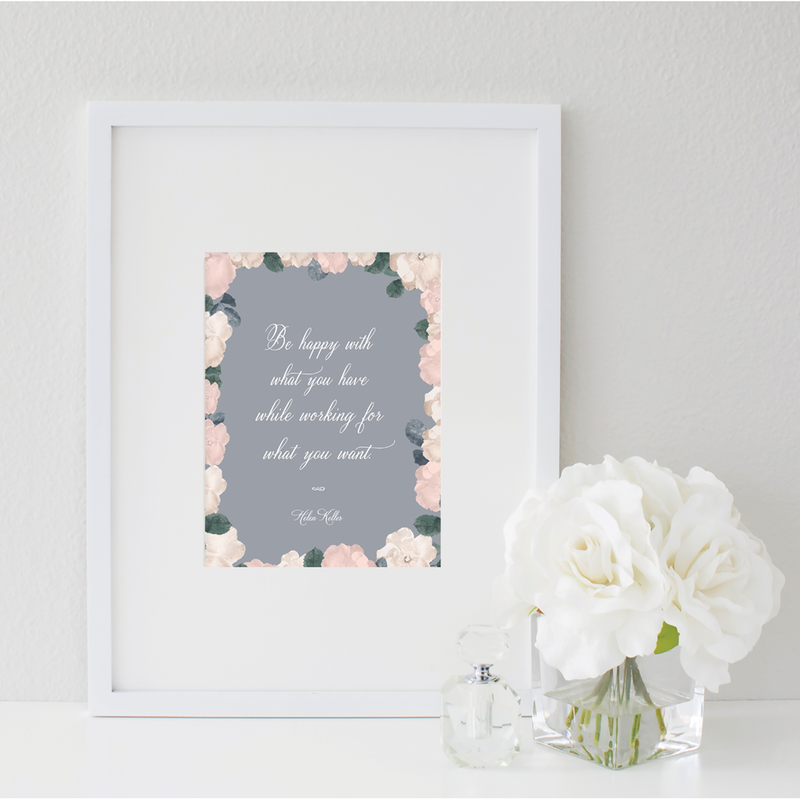 And if you'd like tohave this print in your home or office as a daily reminder, click here to head to the Etsy shop to purchase yours. What is one thing that you are happy with now, that you're working on for the upcoming year? I'd love to hear it and cheer you on!